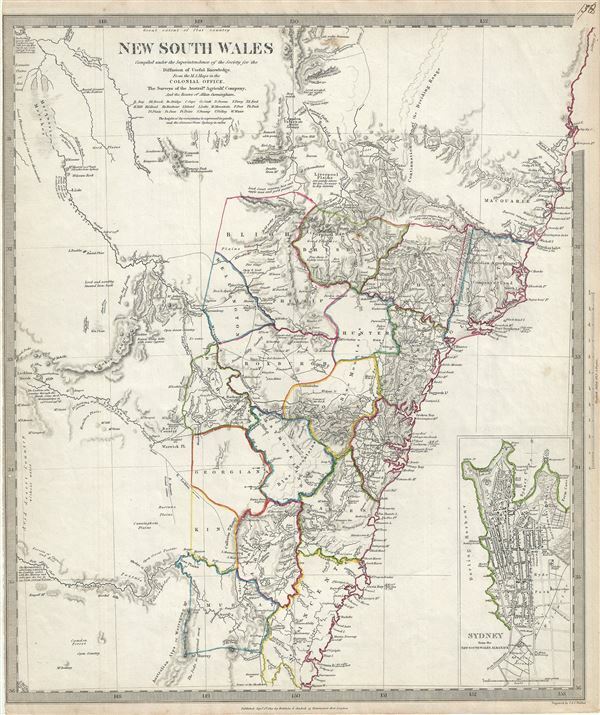 This is a fascinating 1833 map of New South Wales, Australia, by the S.D.U.K. It covers the eastern Australia from Trial Bay to Bateman Bay. Although the coastlines are accurately mapped, much of the interior remains relatively unknown. Several notes throughout note the speculative inland topography, including 'Level and scrubby stunted Iron bark,' 'Barren rocky hills with some Cypress,' 'Extensive Plains of Red Sand,' etc. An inset in the lower right quadrant of the map details Sydney from the New South Wales Almanac. This map was created based on the surveys of the Australian Agricultural Company and the routes of Allan Cunningham, the noted British explorer and botanist. Rumsey 0890.156. Phillips (Atlases) 794.